I’ve recently come across a new way you buying Bitcoins in a safe an simple manner using Western Union. 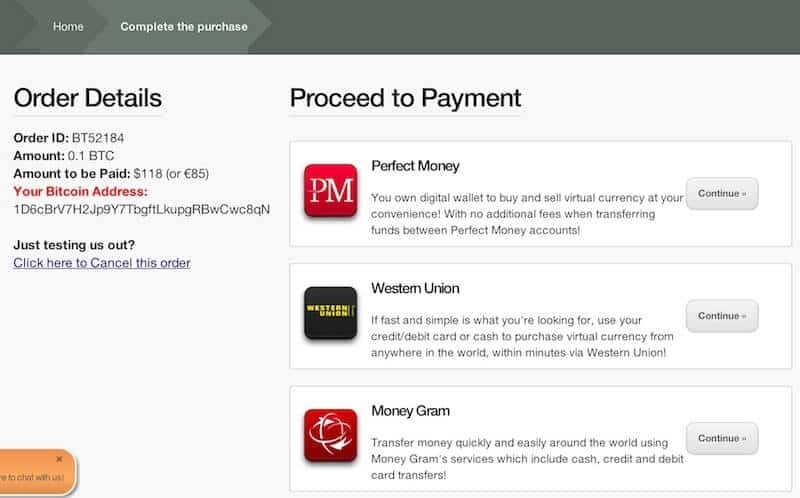 Western Union is a leader in global money transfer just like Paypal. But unlike Paypal it seems that they have much less of a problem allowing people to buy Bitcoin with their service. The good thing about Western Union as that US residents can use almost any type of credit card to pay with it and therefore buy Bitcoins with their credit cards (which is normally not allowed). 1. Unlike other methods of buying Bitcoins with a credit card, here you are not as limited with the amount you can purchase. 2. Once you place your order your price will be reserved no matter if the Bitcoin price goes up when you actually submit your payment. For example, on January 4th 2014 the Bitcoin price $913. Just two days later at the time of writing this post the Bitcoin price is $1073. This means if I would have bought through CoinMama on Jan 4th I would have already covered the commission and then some. 3. From my experience this is the fastest way to get Bitcoin from a company (not an individual) today since it does not require wire transfers or long manual authentication processes. 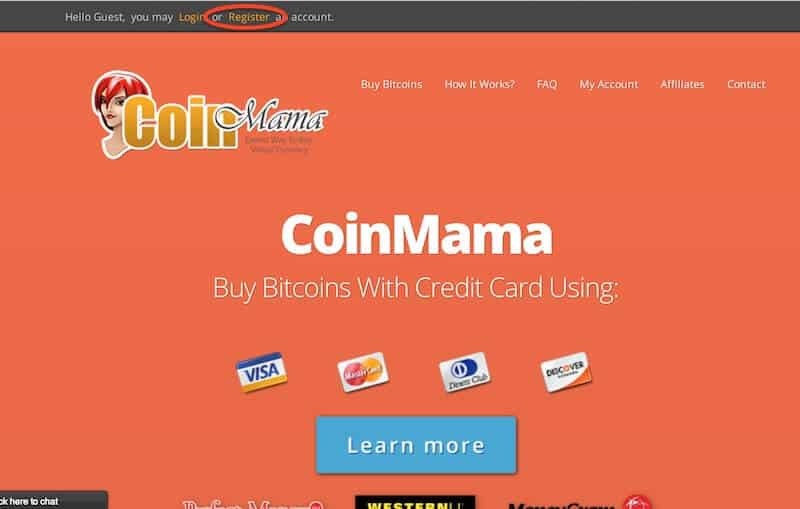 It might take you some time to find the register link for CoinMama but it’ on the top of the screen as shown here. Once you’ve registered, log in with your username and password. Now it’s time to place your order. 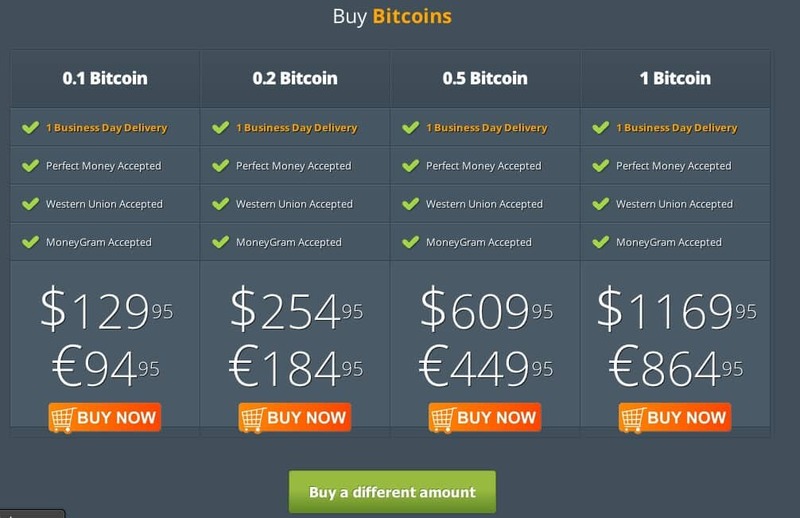 Just choose how many Bitcoins you would like to buy from the available options (middle of the homepage). If you are looking for a different amount you can just click the “Buy a Different Amount” button and submit a request for a custom order. Once you choose the amount of Bitcoins to buy you will need to enter your Wallet’s address and a coupon code (you can use the coupon code 238XX276 to get 1 $7 or 5 EUR discount, hopefully it’s still active). If you don’t have a wallet just use the link that says “Don’t have a wallet ? Click here to create one for free” – This will bring you to BlockChain.info which is one of the leading Bitcoin wallets today. Now you will have to submit a color copy of identification. This could be a Passport, a National I.D. or a Driver’s Licenses. This is a one time requirement only! 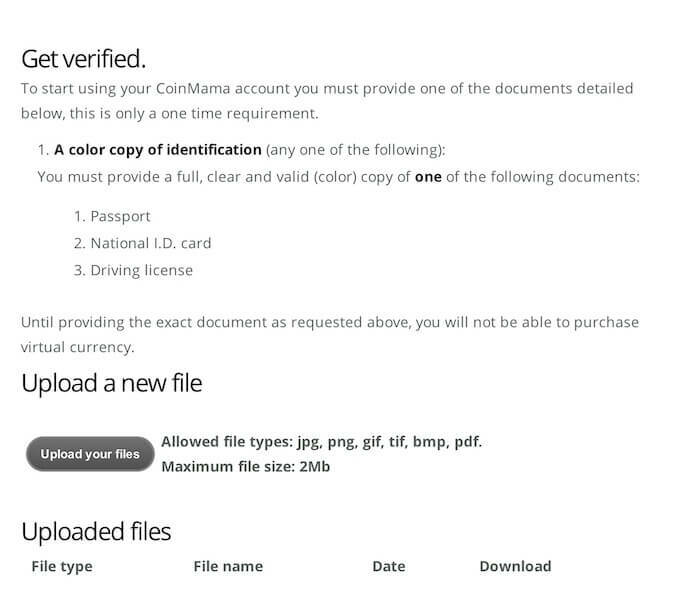 It took me about 45 minutes until I got a verification letter from CoinMana. Select Western Union and continue to step 5. 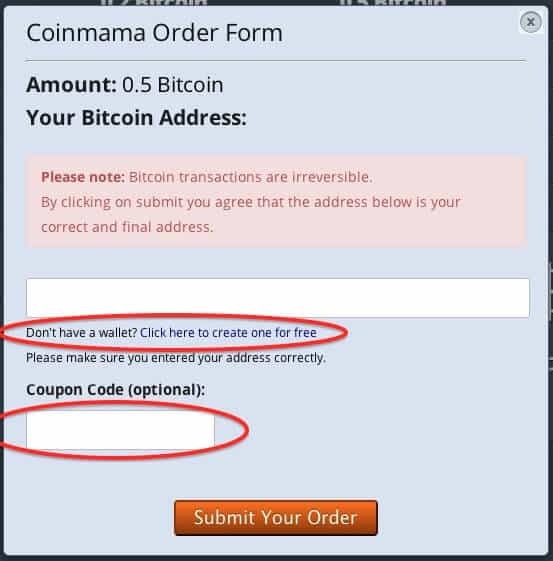 Before you can fill out the order form on CoinMama you will need to complete the payment through Western Union. If you don’t have an account your register one for free. 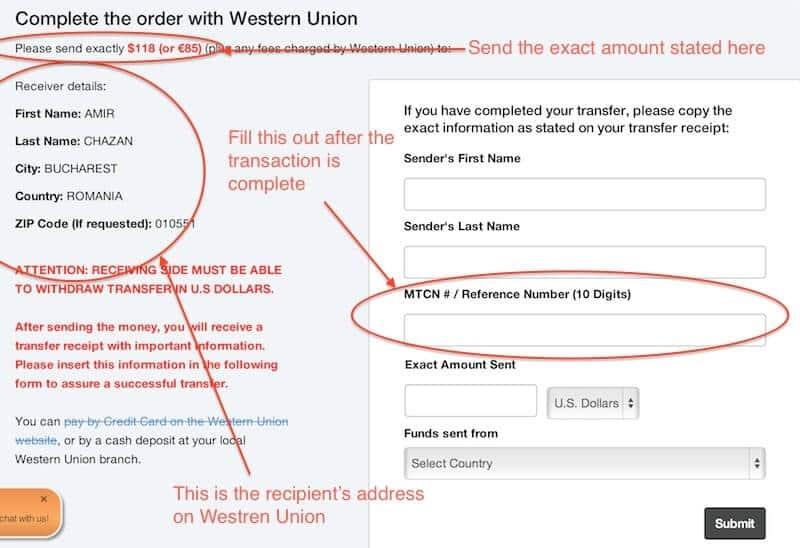 Send the exact amount of money stated to the recipient stated on the left side of the screen. Once complete you will get a MTCN #. Fill out the details on the right side of the screen including the MTCN #. Once you’ve completed this step it will take up to 24 hours (I got mine in a matter of 2 hours) and you’ll see the Bitcoins in your account. If you’re having any trouble along the way don’t hesitate emailing me and I’ll do my best to help you out.